Zippered fabric & snap together rods offer quick assembly without any tools! This exhibition banner is an easy way to have great looking graphics in your exhibition hall, trade show, retail store, or lobby! 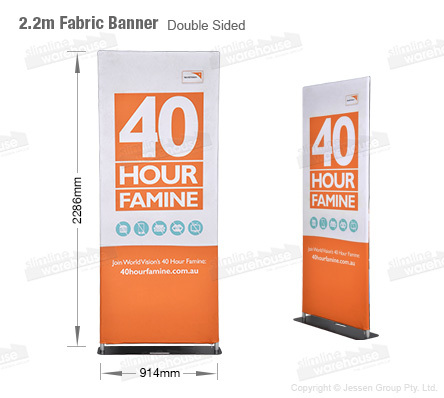 The stand up banners features a 914 x 2286mm full colour graphic that displays your custom designs to readily capture the attention of potential customers. Your designs are digitally printed using a dye-sublimation process that ensures vivid colours and a true representation of your graphics. 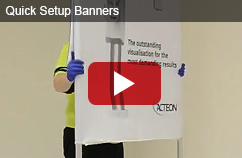 The dual-sided display helps maximise advertising by reaching out to more customers without taking up additional room. The trade show display, exhibition banner use an aluminium frame that is lightweight for easy transport to different locations. Set-up takes minutes without any tools necessary, thanks to the easy snap together rods. The stretch fabric zips around the frame tautly for a great look. This portable display includes a carrying bag that holds all components, helping you transport the display system between events as well as keep it clean in storage between uses! The whole frame attaches to the weighted base, ensuring stability and the stand banner display remains upright during use. Browse our extensive online catalogue to see the hundreds of items that we are offering in a variety of different categories. We add new items weekly to help you stay ahead of the competition by utilising the latest trends & technologies. Orders paid for by 2pm EST will despatch same day with most in stock items from Slimline Warehouse to Sydney, Melbourne, Perth, Adelaide, Brisbane, Hobart, & anywhere else in Australia!